A gate must be easy to open and to close without interrupting the power. The power can be run under ground using lead-out cable. Gate handles are used for locking gates. The gate handle is fixed into a gate anchor. The gate anchor works as a power connector. 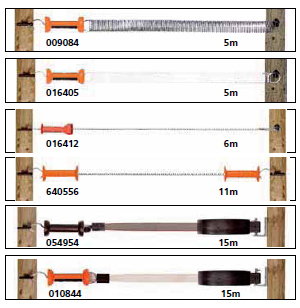 Gallagher offers a range of gate handles and gate anchors. This autoreel set is a very easily installed instant gate, used for example to create a temporary barrier. Maximum width 15m. New strong gate handle in orange with black rubber accents for an optimal grip and excellent visibility. 697000 for cord or wire, 696003 with tapebuckle for 40 mm tape. Heavy duty, durable gate handles in black and orange. Good visibility and large protective shields. Art. 007585 has a compression hook for ease in use. Use art. 010769 for attaching tape to a gate handle.